Last weekend Matt Kennedy and I took off towards a fall not too many have visited. However, one that Matt has visited before. Both times he had been to this location the water was either running way too well, and impassible, or not running well at all. This time he did a little investigation and found that it should be running perfectly; it was. 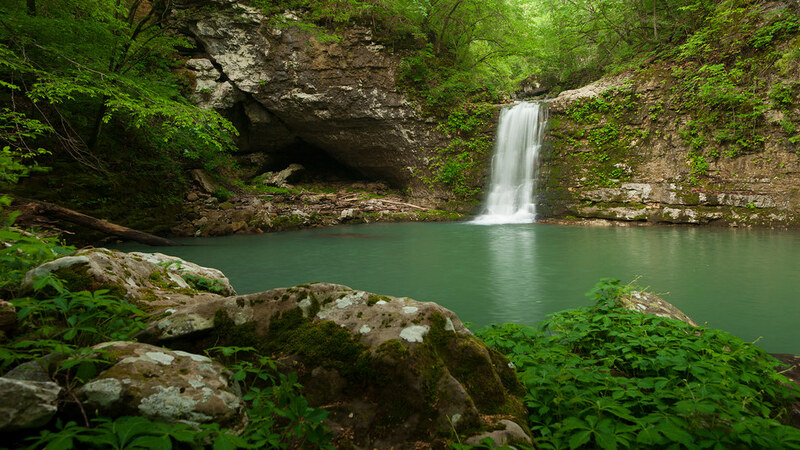 Punchbowl Falls is north of a much more famous waterfall in Arkansas: Twin Falls. The creek on which this waterfall resides is absolutely beautiful and littered with both large and small boulders within a very tight canyon with bluffs exceedingly tall on both sides. While incredibly beautiful, this is not a hike for the faint of heart, because at an elevation change of 2000ft, you’ll be huffing and puffing on your way back out. I think Matt is finally glad to say that he has finally seen Punchbowl with water and I’m glad to say that I have as well. It was an awesome hike and one that I’m glad to have accomplished.